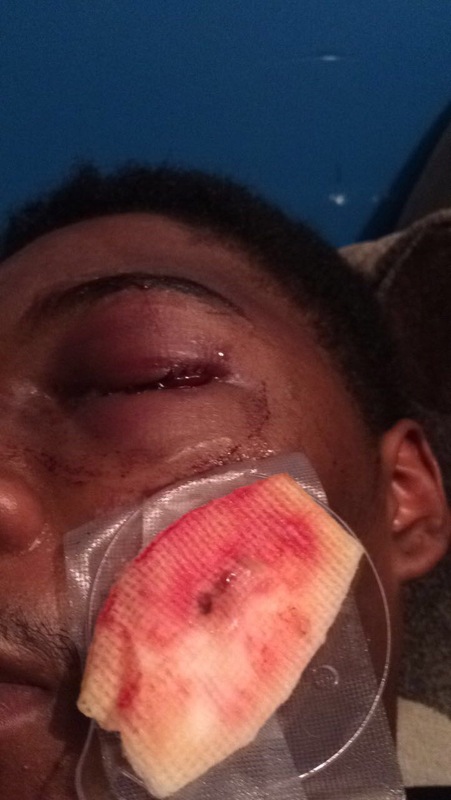 A Toronto police officer is facing multiple charges after allegedly beating a 19-year-old with a steel pipe, so badly he suffered broken bones and will have to have an eye surgically removed. And the lawyer for the teen is accusing police of a coverup. On Tuesday, the province’s Special Investigations Unit charged Constable Michael Theriault with aggravated assault, assault with a weapon and public mischief. The charges stem from an incident in the middle of the night of Dec. 28, 2016 in Whitby, Ont. while Theriault was off duty. Dafonte Miller was allegedly beaten by an off duty Toronto police officer. Photo provided by Miller's lawyer. The SIU, which investigates all incidents involving police officers in Ontario that result in injury or death, wasn’t notified of the altercation until April 27, and by the teen’s lawyer, Julian Falconer. While the series of events are disputed by each side, Falconer told reporters on Tuesday that a car break-in allegedly led Theriault to approach Miller and his friends sometime after 2 a.m. When Miller heard yelling, he and his friends began to run. While his friends got away, Miller did not, and an altercation ensued which resulted in his injuries, Falconer stated. “Dafonte Miller has lost that eye. His eye was actually hanging out at the scene,” said Falconer. Theriault was not injured, according to Falconer. He also alleged Theriault’s brother was with him, although he said he has not been charged. Falconer alleged that once police arrived that night, Theriault accused Miller of using the steel pipe against him, resulting in the 19-year-old being charged with assault, possession of a weapon, as well as theft and possession of marijuana. All charges were later withdrawn following a pretrial hearing. “In the time I have been a lawyer — 28 years — it is easily one of the most inexplicable, senseless, gratuitous attack by a police officer on a member of the public I have ever seen,” Falconer said at a press conference. None of the allegations have been tested in court. Falconer went on to describe the events that followed as a “breathtaking” coverup. “You have two services. Each had an opportunity to do the right thing. Both ducked and, as far as I’m concerned and in my opinion, actively covered up the crime,” he said, adding that although the incident occurred in front of a home with two witnesses inside, they were never interviewed by Durham Regional Police. He also said that Toronto police were made aware of the incident involving one of their officers. Photo provided by Miller's lawyer. But Falconer can’t account for why his client would be charged with assault when it was so clear he was the one who had been brutally beaten. Selby told VICE News that it is the “responsibility of the police service that employs the officer to contact the SIU”, so in this instance the Toronto Police Service. The SIU stated in a press release it would not be discussing the case further as it is now before the courts. A spokesman for Toronto police also declined to comment on the coverup allegations. Theriault, a constable in Toronto’s 42 division, was suspended with pay, the Toronto Police Service told VICE News, and is expected to appear before the Ontario Court of Justice in Oshawa on August 10.